Our highly regarded catering facility lead by our in-house Head Chef Dean Woods offers a wide choice of menus to cater for all types of celebration including dinner dances, quiz nights, themed club evenings, weddings, christenings, wakes and much more. Sunday lunch is certainly one not to miss and is available on the first and third Sunday's in the month. The main bar is situated downstairs and is very spacious for holding larger parties and events and there is also a comfy seating area where you can sit back and enjoy a lovely cup of coffee whilst looking over the course. Food is served in the bar area daily, seasonal timings apply. There is a selection of daily & seasonal specials from our bar menu. Our welcoming bar offers a wide selection of drinks and snacks. 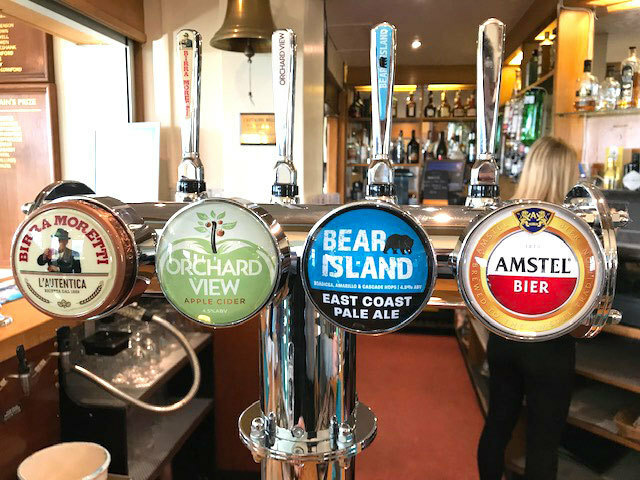 Local brewers Shepherd Neame provide us with an excellent selection of beers, ciders and cask ales. Teas, coffees and an excellent selection of cakes and pastries are available daily.